I served these with Marcella Hazan's marinated green beans for a cool dinner on a hot summer night (complete with Lambrusco). The pesto was made with Kalamata olives since I don't have access to Gaettas. These sandwiches are actually quite rich--just a heads up! With nothing more than a panini grill, a toaster oven, and a few simple ingredients, Jennifer and Jason Denton bring the fresh, robust flavors of Italy to your home table in Simple Italian Sandwiches. Eating in Italy is all about simple pleasures, relaxing with good company, and savoring fresh, no-frills foods like traditional toasted panini, crustless tramezzini, and crunchy bruschetta. 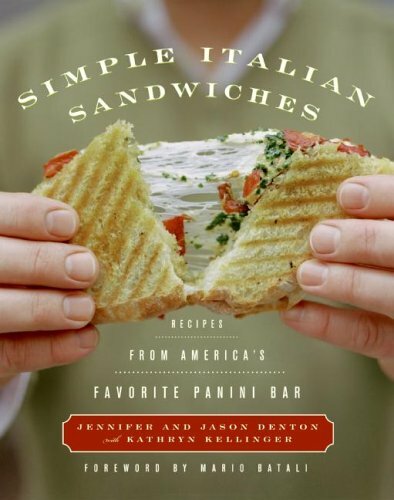 In Simple Italian Sandwiches, Jennifer and Jason Denton offer up a collection of recipes for these classic bread-based dishes, plus condiments, antipasti, and salads that are easy enough for the novice cook yet tasty enough for anyone with a sophisticated palate. From Soppressata, Fontina, and Arugula Panini, to Mozzarella and Basil Pesto Tramezzini, to Roasted Butternut Squash, Walnut, and Asiago Bruschetta, the dishes can be prepared in minutes and require minimal cooking. With simplicity the governing rule for today's busy schedules, Simple Italian Sandwiches is the ideal cookbook for anyone who wants to prepare vibrant, flavorful food for family and friends, and then sit down and enjoy it with them.